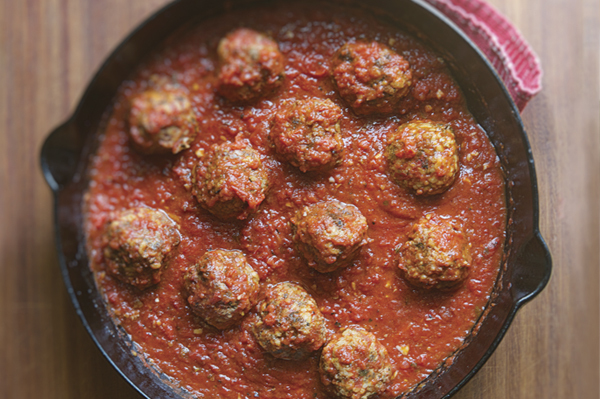 It’s no secret that I love cooking up a big batch of these traditional chipotle meatballs. I mean, I’ve included some version in no less than three of my cookbooks. But I don’t want you to even have to consult a cookbook. I want you to file this one away in the recipes (and proportions) to know by heart. That way, you can vary the outcome based on what’s on hand. Let’s start here: A basic meatball is typically a combination of ground meat, something to soften the meat’s tendency toward firmness and something else to keep it from falling apart. In Mexico, the meat is typically ground pork, beef or a combination of the two (though I’ve made this successfully with ground lamb, turkey and chicken thigh), and the typical softener is cooked rice. An egg helps hold everything together. Besides salt, the typical seasoning is chopped fresh mint (or other herbs) and like many Mexican cooks I like to add garlic, too. Chopped fresh bacon is another fantastic addition. Add a simple tomato-chipotle sauce and you have one of the most crowd-pleasing dishes I know. Serve with rice or mashed potatoes and a salad. Dinner’s ready. Sounds good but I like the recipe in the original Mexican Everyday. Baked in the oven and made with hamburger it’s one of our favorites.